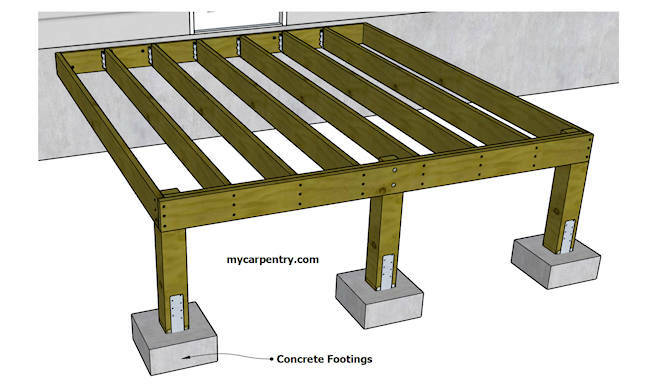 Deck Framing is part 2 (of 7) steps describing how to build your own deck (a 10' x 10' deck example). Framing is perhaps the most important phase of deck building. If the structure is not designed to carry the required load, or if the framing is not level or square, building the remaining deck features like railing and stairs will be frustrating and difficult. It is much easier to build a deck correctly from the start. 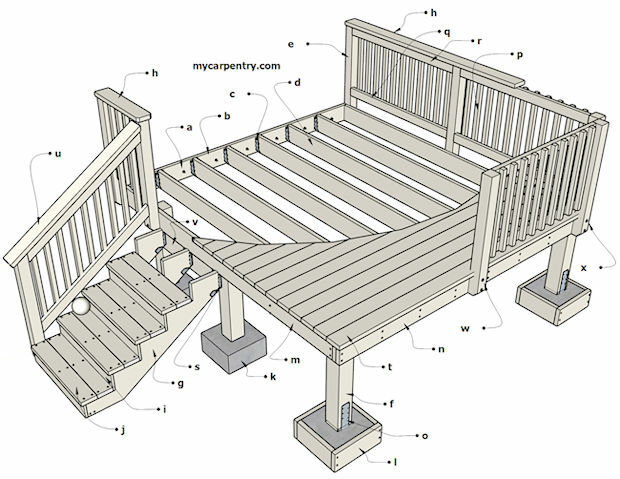 The diagram below lists the various parts of deck construction. 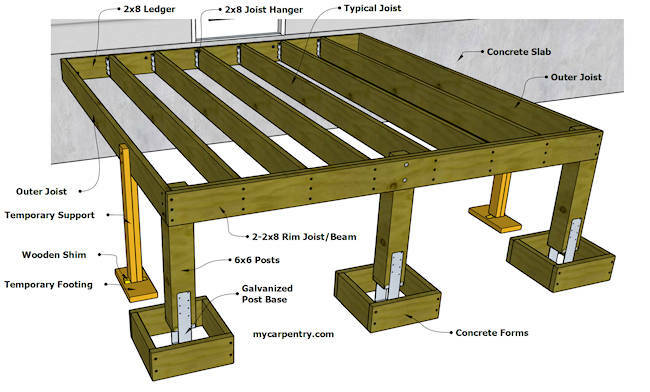 The following tutorial explains the tools, materials, and procedures required to build the deck frame for the 10x10 deck shown above. The tools that you will need to frame your deck are listed below. The list is broken down into the tools that are necessary, as well as the tools that are "nice to have" or optional. The materials required to frame the 10' x 10' deck are listed in the table below (all wood should be pressure treated pine #2 grade or better). The list does not contain the materials required for stairs, decking, or railing. This is just for the basic deck frame and structural 6x6 posts. If you don't have a vehicle to transport the materials, most lumber yards will deliver your materials for a fee. If you want to use this service, be sure to order an extra joist - the nice folks at the lumber yard won't cull the material the way you would. If you have a truck or small trailer, you have the luxury of picking the lumber that you want - you can make sure that each board is straight and is not full of large knots. It is important to pick out the best lumber that is available. Working with crooked lumber is very difficult. When you buy a 10' board, it will not be exactly 10' long. The rough lengths of lumber that you buy from a lumber yard can vary, but are usually about 1/4" to 3/4" longer. 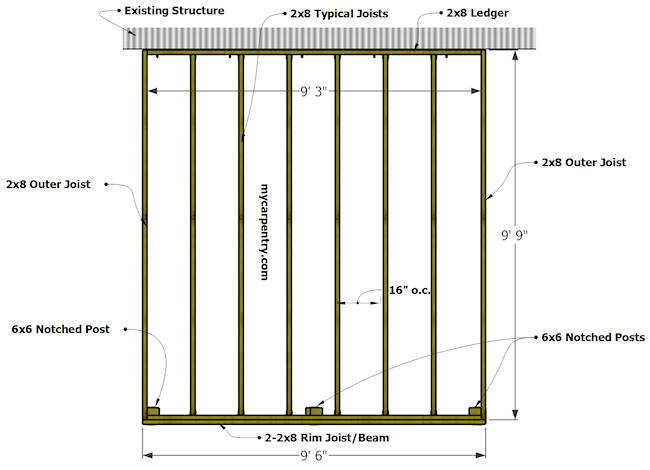 To maximize the use of the deck material (10') and to minimize waste on the 10 x 10 deck project, the finished width of the deck framing will be 9' 6" (2896 mm). The decking material will be 9' 9" (2972 mm) (with a 1.5 inch (38 mm) overhang on the two sides and front of the deck). This allows for about 1.5 inches to be trimmed off of each end of the 10' deck boards. The reason for this is because lumber doesn't come in exact lengths, and often the ends of the boards are discolored, split, or banged up from shipping. See Wood Decking for more information about laying out, cutting and installing the decking material. The first board to be cut for the deck frame, and probably the most important, is the ledger board. In order to build a deck to the exact height and position that you want, the installation of the ledger board must be perfectly placed and level. From the lumber package, select a 2x8 that is straight and not twisted or cupped (ideally, all of your lumber will be straight and perfect). Using a speed square, close to the end of the 2" x 8" ledger, make a square mark and cut it with a circular saw to square up one end. Measure 9' 3" from that end, to the other end of the ledger. Make a crows foot mark with your pencil. Square the mark with your speed square and cut it. This is the ledger board and it is ready for joist layout. Since the joists will be spaced 16" apart, measure from one end of the ledger and make a crow's foot mark every 16 inches (406 mm). Use your speed square to square each mark. Mark an "X" on the left side of each line (this marks the side of the line where the 2" x 8" joists will be attached). From the same end of the ledger board, measure over about 6" (153 mm) and make a mark not less than 2" (51 mm) from the bottom of the ledger board. This will be the location of the first concrete anchor bolt. Make a mark about every two feet on the ledger board, staggering them not less than 2" from the top or 2" inches from the bottom. If the two-foot layout lands on or close to a joist layout mark, just move it to the side until it clears the joist (and the future joist hanger). In this example, the finished deck will be at the same level as the threshold of the door. 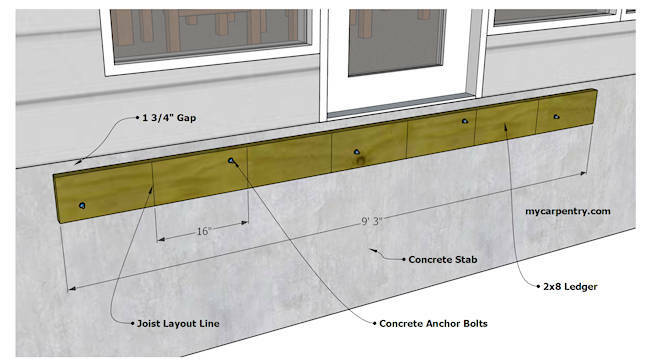 The ledger should be attached approximately 1 3/4" inches below the bottom of the lowest part of the threshold (this is to that your 1 1/2" decking will easily slide underneath the threshold). If you choose to use decking that is not 1 1/2" thick, adjust the height of the ledger board accordingly. Once the height and position of the deck has been determined, make a pencil mark on the concrete foundation where the top of the ledger board will be placed. Using your level as a straight edge, draw a level line across the concrete slab the full length of where the ledger board will be attached. Using a 1/2" paddle bit, drill holes through the ledger board where you marked them for anchor bolts. Once the holes have been drilled, use a ram set to temporarily attach the ledger to the slab. 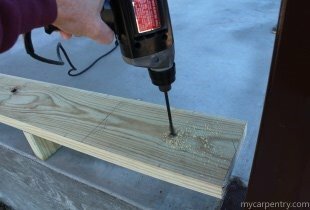 After the ledger board has been firmly attached with nails (applied by using the ram set), use a hammer drill to drill 1/2" holes in the slab through each of the holes previously drilled in the ledger board.. The holes in the concrete need to be deep enough so that no more the 3/4" of the concrete anchor sticks out once it has been hammered into the hole. ** Note: You can't take the anchor out once you drive it in - they are meant to only go one direction (in, not out). To ensure that your holes will be deep enough, you can measure the length of the anchor bolt and wrap a piece of tape around your hammer drill bit (that same length) to be used as a gauge to ensure that you have drilled a deep enough hole. It is better to drill the holes a little deeper than what you need, just to be certain that the hole is deep enough. 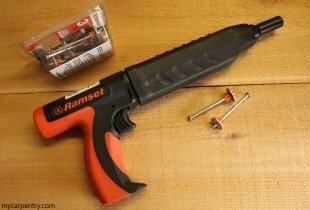 ** Tip: Thread the nut on the anchor bolt before you start pounding it in the hole with your hammer. If you don't, getting the nut threaded onto the bolt will be more difficult if the threads on the bolt are damaged by the hammering. Once the holes are drilled, tap each of the anchor bolts and washer in each hole with a hammer until they are all the way in, then tighten them with a wrench. Once the ledger board is installed and all of the anchor bolts tightened up nicely, you have done a good job! The rest of the deck framing phase is down-hill from here. Pick out three of the straightest 2" x 8"s in the lumber package to build the perimeter of the deck. Even though they may be almost perfectly straight, there's always a little bit of a crown or bow in any piece of lumber. The crown or bow should be positioned upwards to compensate for future sagging. Make a mark on the end of the 2x8s about 1/2" from one end. Use a speed square to mark it square and cut it with a circular saw. Measure 9' 9" from the squared end and make a crow's foot mark with a carpenter's pencil. Mark it square and cut it. Drive a 16d nail in the top of one end of the joist about 1/3 of the way in. 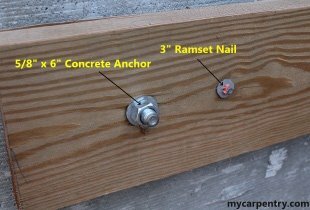 Bend the nail over so that you can use it as a hook to hang the end of the joist on the ledger (until you can nail or screw it into the end of the ledger). ** Note: the 16d nail takes the place of a person holding that end of the board up. Use a temporary support to hold up the other end (use one of the 2x4s that you got from the lumber yard). Before attaching the temporary 2x4 support, use a level to level the rim board. 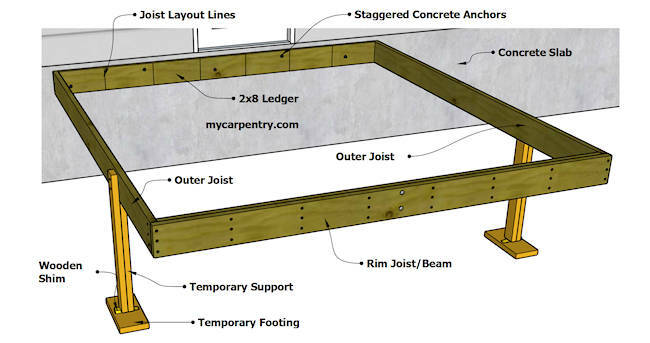 Nail the end of the joist to ledger with 16d nails (see the diagram below). Attach another outer joist on the other side of the ledger using the same technique as described above. Remember to position the crown up on all framing members (ledgers, joists, etc.). Using the remaining "straight" 2x8, cut it to the same length as the ledger, and nail it to both ends of the previous two joists. This is called the band board or rim joist. Nail an additional 2x8 to the inside of it to make it a double 2x8 beam. The perimeter of the deck frame is now complete. Lay out the inside face of the rim beam @ 16" centers, mirroring the ledger board layout. ** Note: Sometimes the existing concrete slab will bow out or in (slightly) and will make the ledger bow out or in as well. I recommend measuring each internal(typical) joists before cutting and installing them. Cut, crown, and nail each of the remaining typical joists using the same technique as the rim joists that attach to the ledger. 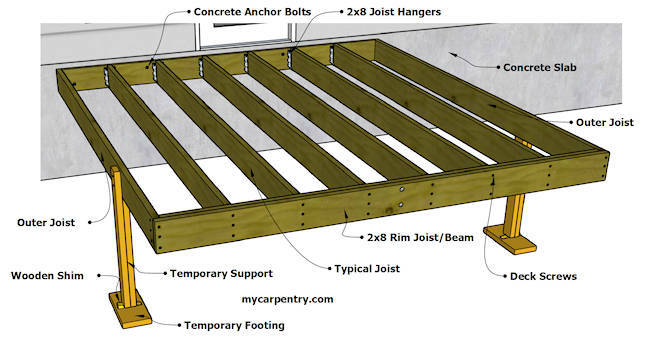 Add the 2x8 joist hangers per the manufacturers recommendations. Using your tape measure, measure from one corner and make a mark on the outer rim beam at 36" (914 mm). Measure from the same corner along the outer edge of the perpendicular rim joist and make another mark at 48" (1219 mm). If the deck framing is square, the length between the two marks should be 60" (1524 mm) (visit Carpentry Math for more detail). If the deck frame isn't square, shift it from side to side until the points line up perfectly. Check the deck frame again to ensure that it is still level. Beneath the location of each 6x6 post (not yet installed), dig the appropriate footings and/or build the necessary concrete forms, to comply with local building codes and soil conditions. See deck footings for additional information. Once the holes for the footings have been dug and prepared for the concrete (whether it be earth or wooden forms), the posts can be cut and installed. Notch one of the 6x6 structural posts so that the part that is not notched fits into the deck framing. The post below is notched so that it would fit beneath the front-right corner of the deck. The front-left corner would be different. 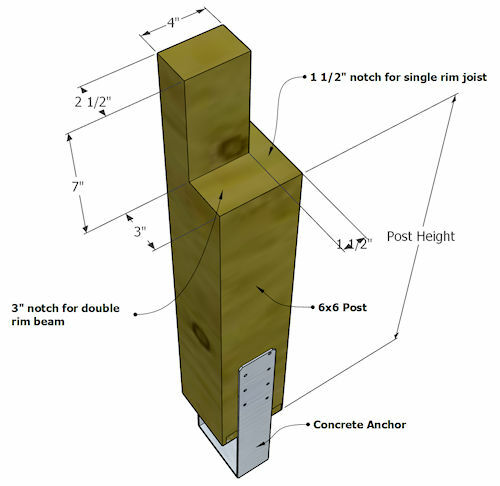 Before cutting the length of the 6x6 posts, determine the post height. 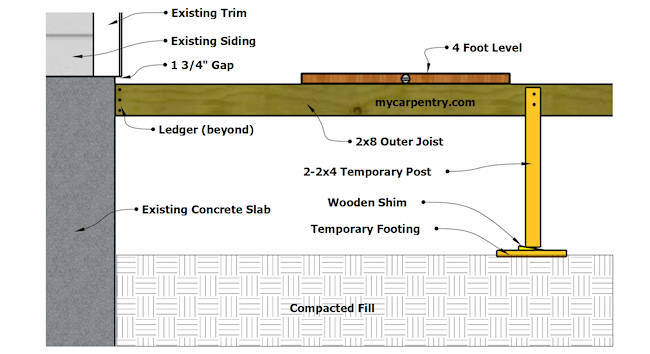 The post height, in this case, is the distance from the bottom of the deck to the top of the finished concrete footing - measure from the bottom of the footing (before the concrete is poured) to the bottom of the deck, and subtract the finished height of the footing. Cut the 6x6 post and attach an approved anchor to the base of it. 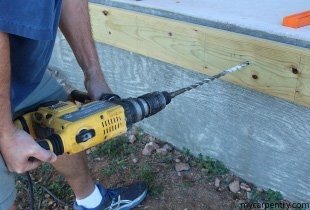 Attach the prepared posts to the deck frame using 16d galvanized spiral nails or 3" deck screws. Make sure each post is plumb before securing all fasteners. Before pouring the concrete footings, double check the deck to ensure it is still level and square. Once the concrete has been poured, let it cure for about 24 hours before continuing construction or removing any concrete forms. After reading this tutorial about deck framing, you probably thought of a few ideas of your own that might make framing this deck easier. I would appreciate any feedback or input you may have. Please contact us any time.